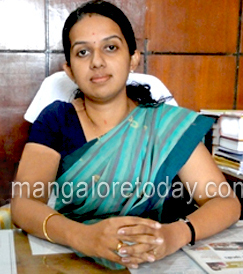 Mangaluru, July 5, 2015: Speaking on ’women in administration’, during the women’s cell inauguration, organised by the department of political science of the St Aloysius College at the college July 3, Dakshina Kannada Zilla Panchayat Chief Executive Officer P I Sreevidya IAS, said women entrants into IAS is on the rapid rise. They are playing crucial roles in decision making, administration and implementation in the Panchayat Raj system. She added participation of women in decision making is very good in Dakshina Kannada. There is lack of confidence among women in North Karnataka. The government has decided to give training to the women members of panchayats so that they can actively participate in the decision making process. The CEO said she never faced any problems as an executive officer in five years. Trained without discrimination and she neverfaced any problem as a woman officer. Gender was never a problem in any official action. Duty demanded to point out the legal status. If the procedure goes against the law, the higher authority is involved. As an IAS officer, you should be ready to work in any part of the country. she is in Karnataka and her husband belongs to another cadre and works in another state. and this may continue. But, civil service is a passion and be ready. There is nothing like sacrifice," she said. Meanwhile, she said though North Indian still dominate the list, South Indians are showing more interest towards civil service examinations. More candidates from Tamil Nadu and Kerala are writing the exams. The 2010 batch IAS officer P I Sreevidya suggested students to participate in various activities in the college conducted through women’s club, NSS or NCC. It may not help to score more marks, but it surely makes one a better citizen, she said. Adopt villages or schools under NSS and create awareness on health and hygiene and waste management. Organise programmes in villages to create awareness about the government schemes towards micro financing. Teach poor children in the backward areas. Visit backward class hostels and interact with the children, she suggested. Political Science Department Head Dr Roseveera D’Souza, Finance Officer Fr Andrade, English Department Lecturer Girish and others were present among a host of students.